« The Chapman formation: did he really create something new? This weekly series charts Arsenal’s final season in Plumstead and the move to Islington that, effectively, saved the club’s very existence. 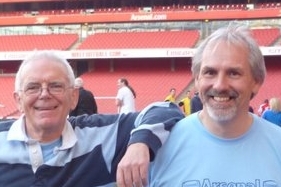 The Woolwich Arsenal team journeyed up to the north-west to play Oldham. Captain Percy Sands and Charlie Randall returned to the team after missing one and two games respectively. The corresponding fixture the previous season had finished goalless and, with Oldham missing relegation by only point, the Reds were confident of getting at least a point from this game. Arsenal kicked-off the game on a bight sunny day. The early part of the game was played almost exclusively in Oldham’s half as the Reds looked to get an early goal. Oldham threatened with a breakaway but nothing came of it. Arsenal’s pressure eventually eased and then Oldham had the better of the play. Davies headed wide and then forced a great save from Crawford. Arsenal’s defence was solid, with Shaw and Sands commanding. In a very see-saw game, Arsenal then had a spell of pressure with shots from Lewis, Greenaway, Common and McLaughlan. The game was then transferred to the Arsenal end with Crawford making some fine saves. Neither team could score in the first-half and they swapped ends with the score 0-0. The second-half mirrored the first, with both teams having spells of attacking. Percy Sands had a pot-shot from 30 yards and Common a close-range shot but Matthews was equal to them. Davies kept Crawford busy but his wayward shooting and the goalkeeper being on excellent form kept him at bay. End to end play ensued but both defences were superior to the attacks which resulted in the game finishing 0-0 as it had done the previous season. The reports gave the impression that Arsenal were unlucky to come away with just one point, on the whole being the more superior team. But, as we see today, possession does not necessarily give you the points. Crawford had his best game of the season, Sands was a rock in the centre and Greenaway continued his excellent form on the wing. The forwards had plenty of chances but Oldham’s goalkeeper also had a great game. Depending on which source you read, the attendance was 7,500, 8,000 or 14,000! A point away from home against a team above them meant that Arsenal were happy for another week. Four points from three games was good form – enough to win the league the previous season. During the week, Woolwich Arsenal’s reserves played a South Eastern League game at Watford. Three changes were made to the team for the previous game, with new recruit James Robertson making his debut. Robertson gave an early indication of his worth by putting the young Reds ahead. The lead was short-lived, though, as Watford then equalised from the re-start. Charlie Lewis restored the lead and the score remained 2-1 at half-time. Lewis had a goal disallowed for off-side early in the second-half but King put the game beyond doubt, the final score being 3-1. Robertson looked to be a star of the future with some fine runs and shots. With the first team playing away, the reserves played host to Chelsea in the South Eastern League. This game had been designated as Roddy McEachrane’s benefit match. This was similar to a testimonial game, but players did not have to play for a club for ten years to be eligible. Clubs would have to apply to the FA for a player to be awarded a benefit match. The player would be given the gate receipts for the game. If the gate receipts did not cover the guaranteed benefit fee, the club would generally make up the difference. McEachrane had joined Woolwich Arsenal in 1902 when they were still in the Second Division. 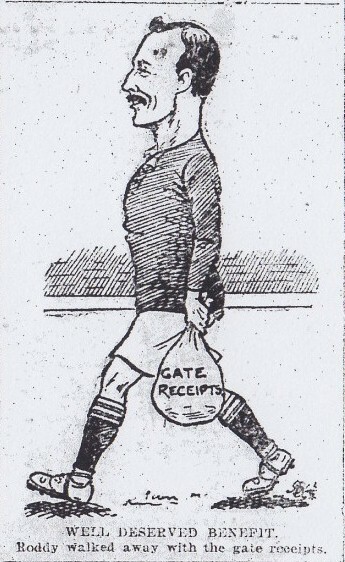 He had been first choice left-half until the 1911-12 season and had played more games for the club than any other player. He had been at the club so long that this was his second benefit match, the first being in 1907 against Liverpool. Three changes were made to the team that beat Watford. Grant replaced Rogers which resulted in a major re-shuffle in defence and midfield. Burrell came in for Groves and Winship replaced Lewis who was called up to the first team. A crowd of 3,613 turned up which resulted in receipts of £46 for Roddie. Chelsea took the lead after 10 minutes following a mis-kick by, of all players, McEachrane. They kept the lead until half-time. After 60 minutes, a melee in the Chelsea goalmouth resulted in a defender handling the ball and Arsenal were awarded a penalty. Alex Graham converted with a fine rising shot. Shortly after this Hanks picked up an injury and he swapped places with Winship. Arsenal were then awarded another penalty when Cartwright tripped Hanks in the area. Graham took the kick, putting the ball in exactly the same spot again. The tackle finished Hanks off and he hobbled off after seeing Graham score. The game finished 2-1 which put the reserves one point clear of BristolCity at the top of the South Eastern League table. Burnley bought former Arsenal player James Bellamy from Motherwell for £1,000. Whilst in Manchester for the Oldham game, the Arsenal team and manager visited Andy Ducat in hospital. At the end of the game against Oldham, David Greenaway was told of his mother’s death and journeyed home to Coatdyke in Scotland for the funeral. 30th September 1912 – Another week, another point. 23rd September 1912 – Crisis? What crisis? 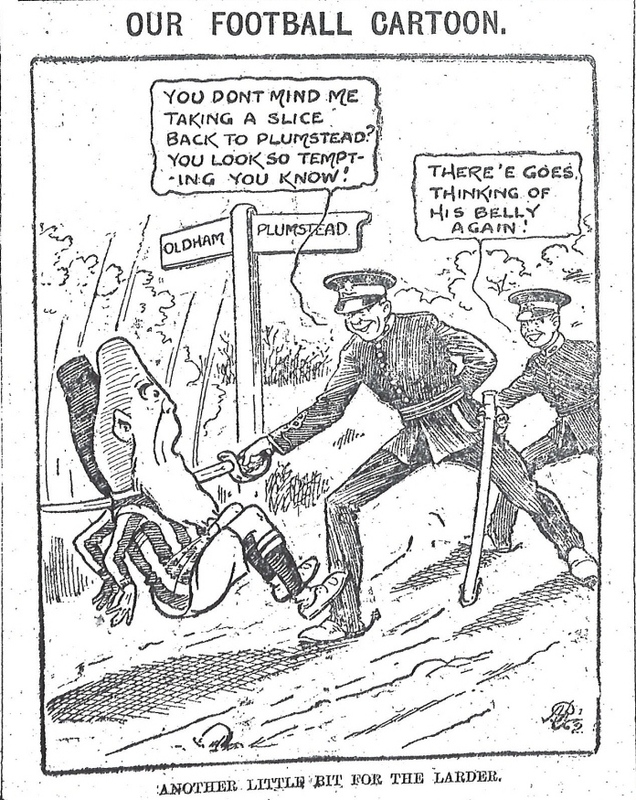 7th September 1912 – What was happening in Plumstead 100 years ago? if it wasn’t for the brutal cartoons I wouldn’t bother at all. Transfer gossip! That’s what we want. Big Al, never mind. Transfer gossip, when it is actually likely to happen, is covered on Untold Arsenal – along with corruption issues, financial issues, and even the odd bit of humour. If you find something boring, best not to read it.